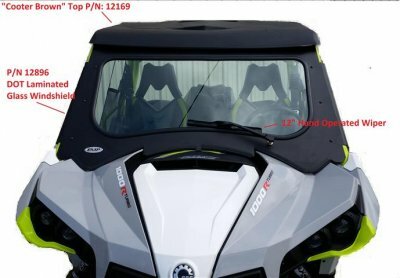 Can-Am Maverick Laminated Glass Windshield P/N: EMP-12896 Fits: 2013-2017 Maverick and Maverick Max Laser Cut and CNC formed. Laminated Glass. DOT Rating etched into glass. No drilling or cutting required. 12” Hand Operated Wiper Included. Powder Coated-Texture Black. Ships via FED EX or UPS to your door. Made In Cleveland Ohio. Now, you can have a Laminated Automotive style glass windshield on your Maverick or Maverick MAX. The metal frame is made from 14 ga. steel. The Laminated glass is nearly ¼” thick. The DOT rating is etched into the glass. Windshield includes a 12” hand operated wiper. It clamps to your cage with (6) clamps provided. We reserve the right to make modifications/improvements to our products at any time. Vehicles may have changes throughout the year. Therefore, pictures are a representation of the product you will be getting but may vary due to product revisions. It is pictured with the EMP “Cooter Brown” plastic top P/N 12169 and EMP Aluminum Top P/N 12424. It will also work with the Max top P/N 12429. We have included pictures of the top of the frame so you can determine if it would work with another manufacturers top that you may have. NOTE: the wiper is our standard 12” blade therefore it will only wipe a 12” wide area.